When I blew the whistle on the CIA’s illegal torture program, I was derided in many quarters as a traitor. My detractors in the government attacked me for violating my secrecy agreement, even as they ignored the oath we’d all taken to protect and defend the Constitution. All of this happened despite the fact that the torture I helped expose is illegal in the United States. Torture also violates a number of international laws and treaties to which our country is signatory — some of which the United States itself was the driving force in drafting. I was charged with three counts of espionage, all of which were eventually dropped when I took a plea to a lesser count. I had to choose between spending up to 30 months in prison and rolling the dice to risk a 45-year sentence. With five kids, and three of them under the age of 10, I took the plea. Tom Drake — the NSA whistleblower who went through the agency’s chain of command to report its illegal program to spy on American citizens — was thanked for his honesty and hard work by being charged with 10 felonies, including five counts of espionage. The government eventually dropped the charges, but not before Drake had suffered terrible financial, professional, and personal distress. This is an ongoing theme, especially in government. Chelsea Manning is serving 35 years in prison for her disclosure of State Department and military cable traffic showing American military crimes in Iraq and beyond. 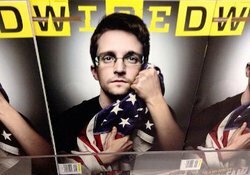 And Edward Snowden, who told Americans about the extent to which our government is spying on us, faces life in prison if he ever returns to the country. He finally resigned from the department after receiving credible death threats. It’s not just government employees either. Whistleblowers first brought attention to wrongdoing at Enron, Lehman Brothers, Stanford International Bank, and elsewhere. And what’s their reward? Across the board, whistleblowers are investigated, harassed, fired, and in some cases prosecuted. That’s the conclusion of author Eyal Press, whose book Beautiful Souls: The Courage and Conscience of Ordinary People in Extraordinary Times documents the struggles of whistleblowers throughout history. Press’s whistleblowers never recover financially or professionally from their actions. History seems to smile on them, but during their lifetimes they remain outcasts. This is a tragedy. Blowing the whistle on wrongdoing should be the norm, not the exception. I recently visited Greece to help the government there draft a whistleblower protection law. The Greek word for “whistleblower” translates as “guardian of the public trust.” I wish our own government’s treatment of whistleblowers could reflect that understanding. Yet even legal guarantees of protection from prosecution and persecution aren’t enough — especially if, as in the case of existing law, national security employees are exempt from these safeguards. Instead, society must start seeing things differently. Like the Greeks, all of us need to start treating whistleblowers as guardians, not traitors. And if we value what freedoms we have left, we should demand that our government do the same. 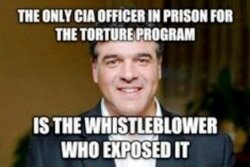 ​John Kiriakou is a former CIA analyst and whistleblower and now an associate fellow for the Institute for Policy Studies in Washington, D.C. He worked for the CIA from 1990 to 2004, including as chief of counterterrorist operations in Pakistan. In an interview in 2009, he became the first former government official to confirm the use of waterboarding against al-Qaida suspects. From 2009 to 2011, he was a senior investigator for the U.S. Senate Foreign Relations Committee. In 2012, he was charged with leaking classified information to journalists and served two years in prison. I’ve mentioned John Kiriakou several times before on these pages. In case you forgot, he was the only person jailed for the CIA’s torture program. Unsurprisingly, he was the guy who blew the whistle on it. ​Blowing the whistle on wrongdoing should be the norm, not the exception. Thank you John, not only for what you did, but for what you continue to do.